This lemon rosemary chicken is incredibly simple to prepare while still being flavorful and delicious. It is a favorite summer meal because it can be prepared quickly with no long marinade time! 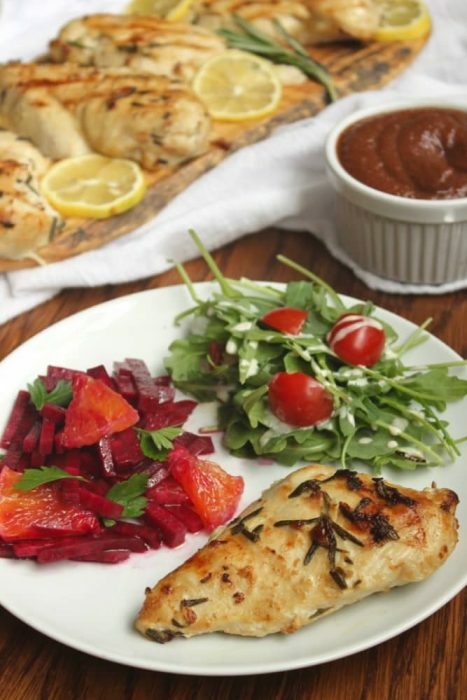 This rosemary and lemon marinaded chicken is delicious on its own or served with this sweet and tangy healthy homemade barbecue sauce. *Note: Did you know that 80% of the antibiotics sold in the United States are for livestock? That is why I choose to purchase chicken raised without antibiotics. 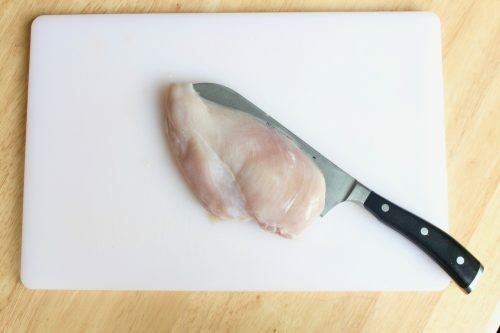 The reason this chicken recipe is super fast to prepare and cook, is because the chicken breasts are split in half. This not only speeds up the marinading time but also helps the chicken grill much faster. 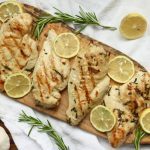 I always double this grilled rosemary lemon chicken recipe to have extra for a my favorite quick summer meal: chicken caesar salad. Rosemary lemon and chicken are such classic pairings. This looks perfect for family meals – I’m sure everyone in my house would love this. Lemon and rosemary totally belong together! This looks perfect! Plus I really love that it’s Whole30 compliant! Thanks Christina! This is definitely one of our favorite quick and easy summer meals. And it was indispensable when I recently did the Whole30! Rosemary on chicken is one of my favourite seasonings! Perfect for a midweek dinner! This looks delicious! I bet the marinade gives it the perfect flavor. Thank you Annemarie! This chicken recipe is the best combination of easy and delicious! 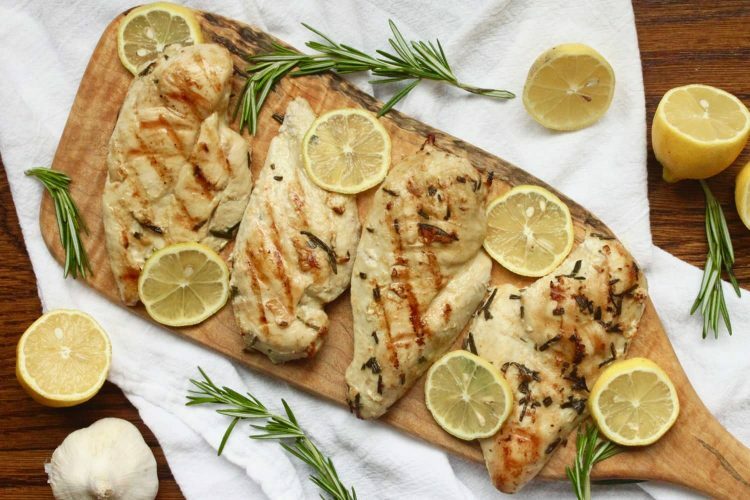 What a delicious combination of flavors: the garlic, lemon, rosemary and grilling! Thanks Megan – sometimes the simplest flavors are the best, right?!? Looks delicious. I love quick and simple meals. Thank you Mirlene! This rosemary lemon chicken is definitely quick and simple… not to mention delicious. I hope you enjoy it! Love this simple weeknight dinner! My kids will love this! Absolutely! Use a baking sheet or cast-iron pan at a higher temperature (400 degrees F) until the chicken is just cooked through. If you want the nice crispy parts that you get while grilling, let the baking sheet or cast-iron pan heat up in the oven before the chicken is added. Simplicity at it’s best! This is so delicious, thank you for the recipe! My pleasure Joni – I hope you enjoy it! 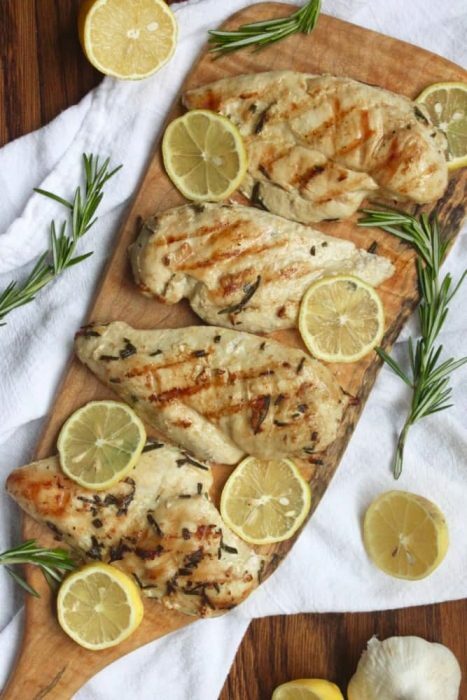 Lemon is one of my favorite ways to flavor chicken! This sounds perfect for the summer. I couldn’t agree more Jean! Keeping it simple with lemon, rosemary and garlic is definitely a delicious way to flavor many meals! Love the simplicity!! Another marinade to add to my list of quick and easy on my batch cooking days!! Thanks Tessa! This lemon rosemary chicken is definitely a favorite of mine for batch cooking! I love often buy larger packs of chicken to marinate before freezing. Then I just thaw and grill! Did it again …marinated for 4 hours really brought flavours out…enjoyed by all!!! I am so happy to hear everyone enjoyed the chicken Elyssa! And yes, it becomes more flavorful the longer it marinades. I often double the recipe and freeze half for a simple weeknight dinner. Enjoy! Elyssa – I am so happy you enjoyed it! Thanks for reading!